Glaucoma is a common eye condition in which vision is lost because of damage to the optic nerve. The optic nerve carries information about vision from the eye to the brain. 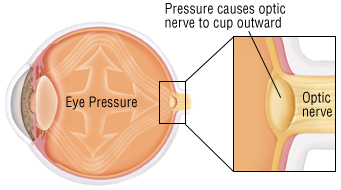 In most cases, the optic nerve is damaged when the pressure of fluid inside the front part of the eye rises. However, glaucoma-related eye damage can occur even when the fluid pressure is normal. In the most common form of glaucoma, called primary open angle glaucoma, fluid circulates freely in the eye and the pressure tends to rise slowly over time. Gradual loss of vision is usually the only symptom.